When Buffalo Police Officers Moe Badger and Mike Norwood sang their hearts out to Ed Sheeran’s “Thinking Out Loud” while ordering food in downtown Buffalo months ago, they had not the slightest clue the plan that God had in store for them. The video has since went viral and today at 4 p.m., the two outstanding officers will appear on The Ellen DeGeneres Show. While this was an opportunity of a lifetime, the two aren’t as excited for themselves as they are about being able to help more kids with their nonprofit charity. CO.P.S.S. (Children Overcoming Police Stereotypes Through Sports) was founded before the duo’s fame to bridge the gap between the community and the police department by fostering positive relationships between kids and officers. The organization frequently hosts events in the community like sports tournaments and provides positive mentorships for children. “It’s really about building relationships and friendships through sports and now singing,” said Badger. 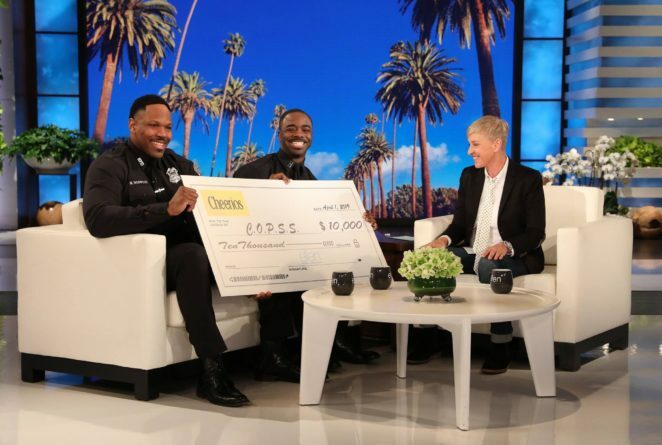 Upon learning more about their initiative, Ellen DeGeneres donated $10,000 to C.O.P.P.S on her show, set to air at 4 p.m. today. Badger says the funding will go towards hosting summits at seven local schools where the duo will answer any questions and concerns kids may have about the police department. C.O.P.P.S will also organize another basketball tournament this year where cops will play against high school teams. “You will be amazed by how many kids come up to us and talk junk to us because we play basketball with them…that’s what it’s all about for us,” said Badger. For more information on C.O.P.P.S, visit www.copssny.org or give them a like on Facebook. Here’s a sneak peek of their appearance below! The show will air at 4 p.m. today!